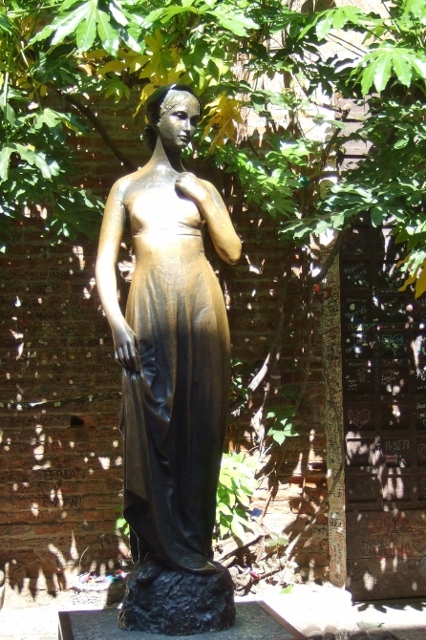 One of Verona’s top attractions is Juliet’s balcony, made famous due to the fact that Verona is the setting for Shakespeare’s romantic tragedy, Romeo and Juliet. The marble balcony at Juliet’s house or Casa di Giulietta in Verona is very romantic and attracts so many visitors every day that I was hard pressed to take a photograph of the balcony without someone peering out over it. Actually this house was not really Juliet’s house but instead a 14th century medieval building that has been restored. Supposedly the Capuleti family lived here in the 14th century, and later the building which was named “Il Cappello,”was used as a pharmacy and then an inn. The city of Verona bought the building in the early 1900's and the balcony was added in 1936 to attract tourism. 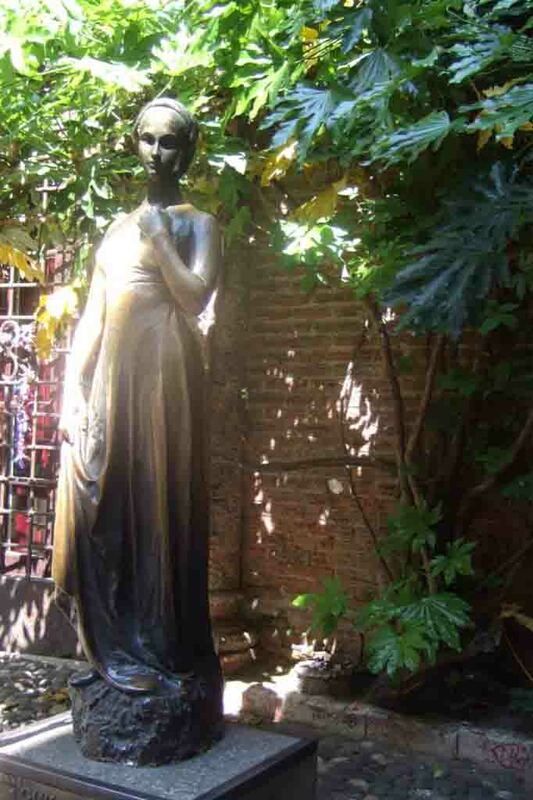 In reality Shakespeare’s fictional character Juliet obviously never lived here but the story lives on and visitors flock here by the thousands, especially after the 2010 film, Letters to Juliet. There is a tour of the “house” which is basically a museum for a cost of six euros but I opted to skip it. 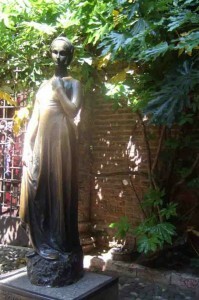 The balcony and courtyard with the famous bronze statue of Juliet draws the crowds as each person waits his turn to stroke Juliet’s left breast. There is a tradition that says this is supposedly going to bring the person good luck. 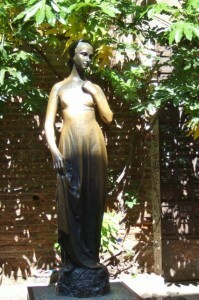 I skipped that too and lucked out to get a photo of the statue alone, between people eager to touch her. One of the gift shops within the courtyard is aptly named Romeo Giulietta and has a nice selection of reasonably priced merchandise with the Romeo Giulietta logo. What caught my eye even more was the other shop which opens into the courtyard also, but this shop features personalized embroidered apparel. As I entered a friendly Italian man asked my name and then promptly embroidered it with a special embroidery capable sewing machine onto a card and gave it to me at no cost. This really is a great marketing strategy, since I liked it so much and was intrigued enough that I spent quite a bit of time browsing around in the shop and actually purchased an embroidered apron as a gift. The young girl at the sewing machine was only too happy to embroider a name of my choosing on the apron which already had the phrase la Regina della Cucina, which translated means the Queen of the Kitchen. There does not seem to be any sign of an economic recession here in this crowded tourist attraction in Verona. Always crowded Juliet’s Balcony is one of the top attractions in Verona and so close to the beautiful Piazza delle Erbe that you have to see it. 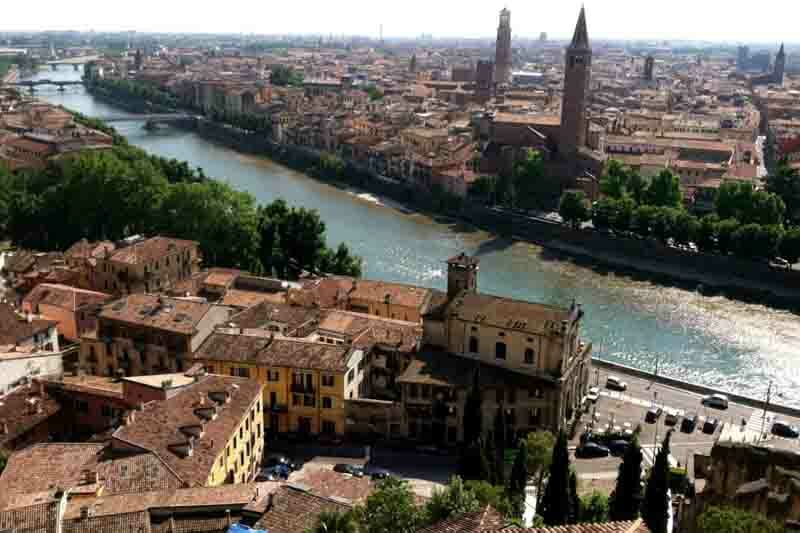 Verona is one of the most beautiful cities in Italy and every year sees millions of tourists. You can easily spend several days here enjoying its attractions, appreciating its architecture and history and tasting its food and wines. I was fortunate enough to be able to spend three days here recently and here are the top 5 attractions to see in Verona. The Verona Arena is the oldest and most famous landmark in Verona. Located on one side of the large Piazza Bra, the Arena, as it is called by the Italians, cannot be missed. This first century Roman amphitheatre, resembling the Colosseum, holds 20,000 spectators. 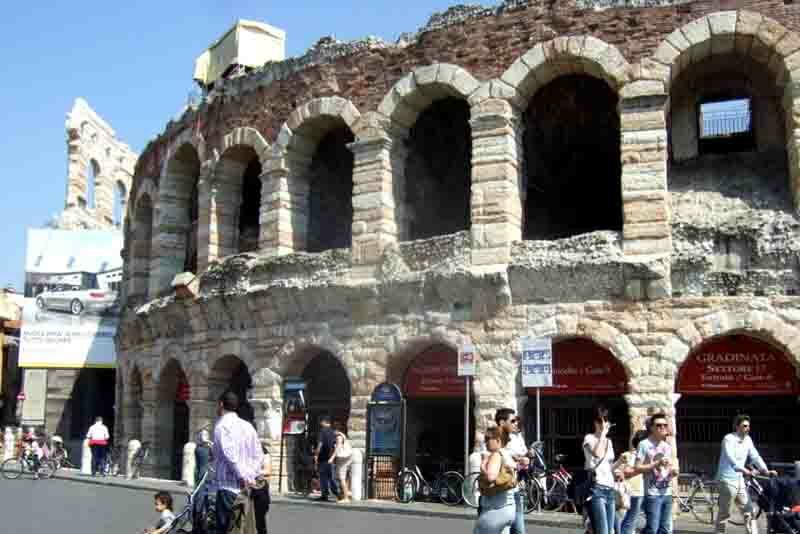 This completely preserved amphitheatre now is the home for the highly acclaimed Verona Opera. This is what you think of when you think of Italy, a large rectangular piazza lined with outdoor restaurants and little shops, and lots of activity day and night. It is one of the most attractive piazzas in Italy with its pink marble, and there are always rumors of American celebrities interested in buying homes here but to date none of those rumors has become fact. The famous thin tower, Torre dei Lamberti is located on the north side as you enter the piazza and at 275 feet high, is Verona’s highest landmark and can be seen from a distance. You can climb it or take an elevator and have fantastic views of Verona from this vantage point. 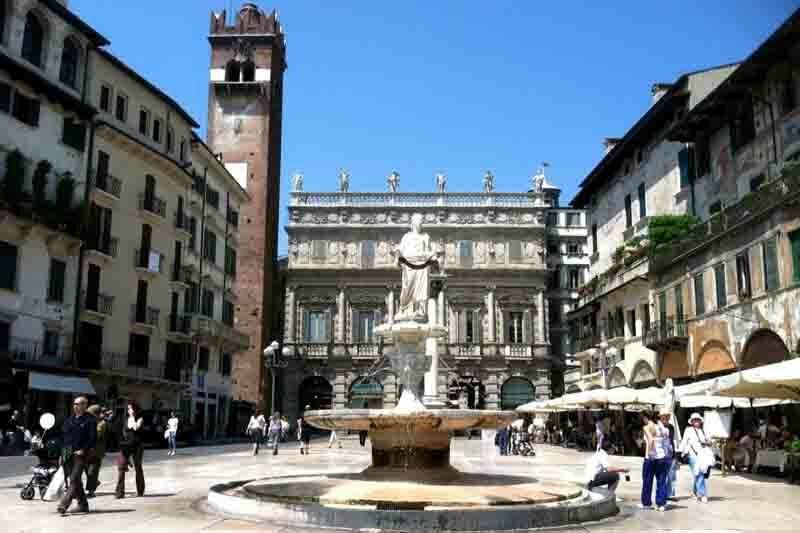 In the center of the piazza is an awesome 14th century fountain with a Madonna statue on top. 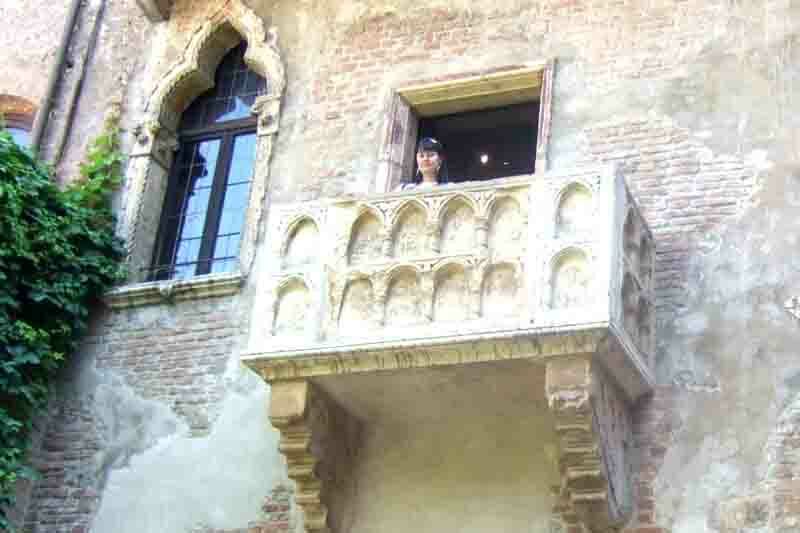 Probably the most touristy site in Verona, judging from the continuous crowds, Juliet’s house and balcony is definitely one of the main attractions in Verona. 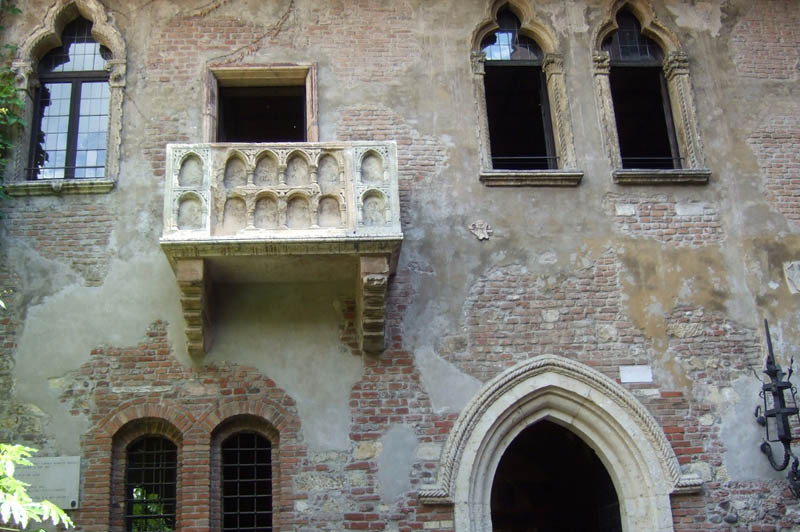 It is not even clear whether this was in fact the house of Juliet but visitors flock to the courtyard to see the balcony where Juliet supposedly stood while Romeo courted her. Beneath the balcony there are lines of tourists waiting to be able to touch the breast on the famous statue of Juliet and have a photo taken. It is something to see while you are in Verona but more a tourist attraction than anything else. If you want to enter the house there is a fee and I decided the courtyard and balcony were enough for me. Castel San Pietro is across the Adige River but you can easily reach this spot by taking the Verona Hop On Hop Off bus for 18 euros, good for 24 hours. I did this and it is a great way to learn about the city as well as get around and see the highlights. Castel San Pietro is high on a hill above the Roman Theatre and originally served as barracks for the Austrian army. The panoramic view of Verona from this terrace is truly picture perfect and would make a great postcard. Another monument from the 14 th century is this huge old castle, which is where it derived its name. Castelvecchio means “old castle.” Inside the red brick castle is a museum with many Gothic and Renaissance paintings and sculptures and guided tours are available. Verona has so many other attractions, all the churches, the bridges and more. These are my recommendations and I am certain that when you go to Verona you will have your own first-hand suggestions. Don’t miss this beautiful piece of Italy. When in Venice, taking the time to get out of the bustle of tourism and head out into some of the lesser visited yet nearby cities adds excitement and interest to your vacation. 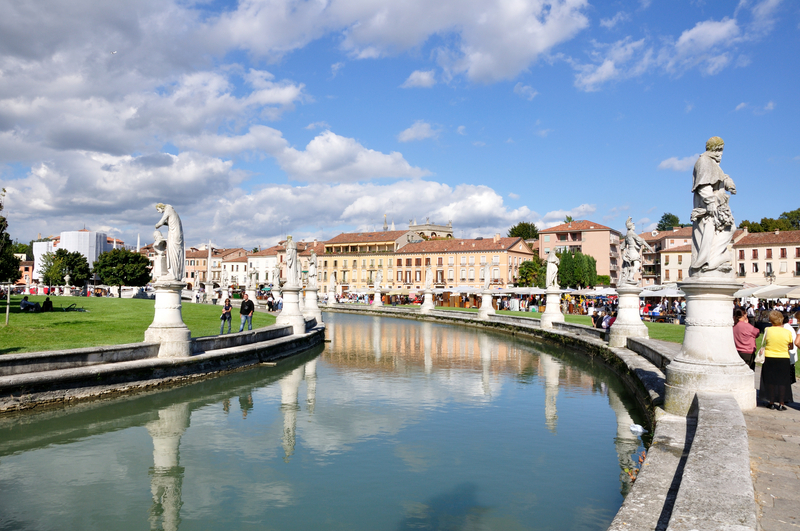 A day trip to San Dona di Piave, Italy is well worth your time, as the city offers places of historical interest as well as an annual celebration of the founding of the Friendship Pact every year on August 7. Situated on the coast, San Dona di Piave, Italy offers visitors much to enjoy on even a short excursion. San Dona di Piave, Italy is located just 40 km northeast of Venice, on the banks of the Piave River and shores of the Mediterranean Sea, about a one hour drive from the center of Venice. The ideal location of San Dona di Piave, Italy makes for a mild climate, with average highs above freezing even in the coldest month of December, and summer temperatures into the 70s and 80s Fahrenheit. Visitors will enjoy stepping out of the travel coaches or cars and walking through the historical and cultural centers of the city. Among the must see places in San Dona di Piave, the Duomo of Blessed Virgin Mary is a draw for Catholic visitors and those who enjoy the beauty and art of Christianity. The Church of Saint Charles in Chiesanuova is another must-see stop for visitors to get a feel for the city's rich Catholic history. Enjoy a picnic lunch of local wine and cheese at the Villa Ancillotto and its ornamental historical park during the warmer months of the year. 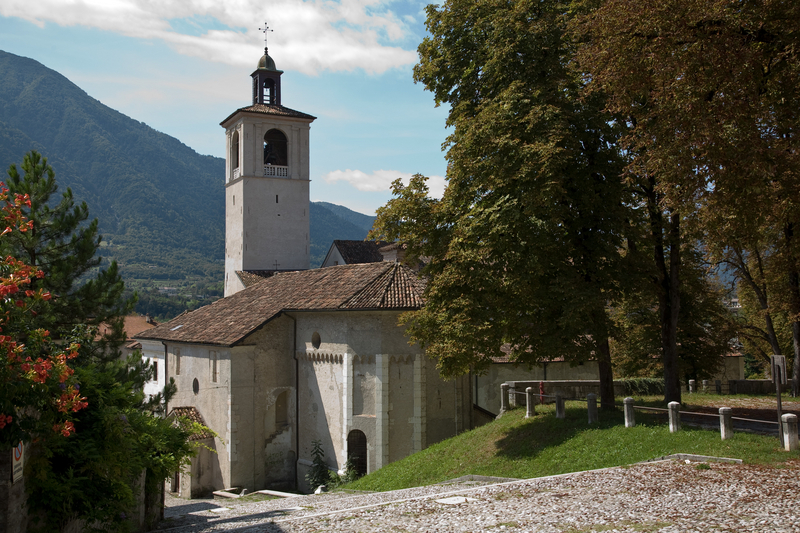 In addition to the historical churches and parks, San Dona di Piave also offers three museums of significance. Museo della Bonifica, or the Land Reclamation Museum, presents the ancient history of the area as well as contemporary history through World Wars I and II and the environmental changes related to the flooding of the Piave River. 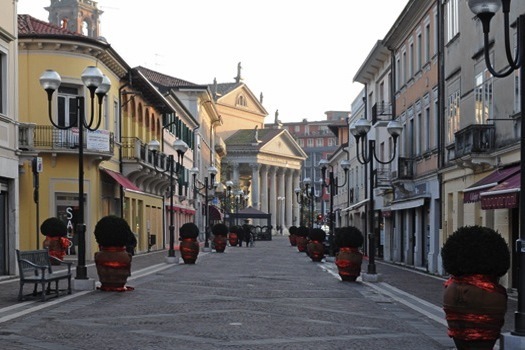 Students and appreciators of art will enjoy a stop at the Galleria Civica d'Arte Moderna e Contemporanea, or the Gallery of Modern and Contemporary Art of the city. Finally, make time for a walk through the Parco della Scultura in Architettura, or Park of Sculpture in Architecture, which is an open air museum open year round for visitors.